Is wipe and mop classification a suitable indicator for application? Comparing wipes from different sources is an inexact science due to the variability between different test methods and testing equipment. The test methods for particles and fibres often vary considerably and the results even more so. The test for residues and ionic contaminants are more established and repeatable. However, the only way to truly compare results for different wipes is if they have been tested to the same test method by the same laboratory. The majority of wipe manufacturers will publish the standard IEST test results on their technical datasheets to help customers decide which wipe is most suitable for their particular environment. A good datasheet will declare which test method has been used. If the test has an in-house reference, it will be necessary to ask for a copy of the method to determine whether that result can be compared with another manufacturer’s results. To get as much out of this data as possible, it helps to understand the different tests. 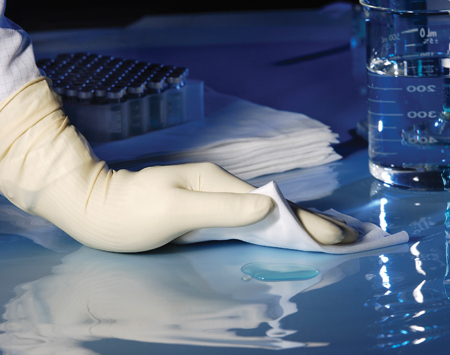 IEST-RP-CC004 guidance divides wipe testing into two key areas: function and contamination. Functional wipe tests look at the sorbent capability – the volume and speed of liquid uptake. With regards to contamination (or cleanliness) the list could be open-ended, but it typically focuses on particles and fibres of specific sizes, non-volatile residues (NVRs) in different solvents and specific inorganic ions. Basis weight: Usually reported in the format g/m2, knowing a wipe’s basis weight is important as it then allows other measurements to be expressed in units of either weight or area. The determination of basis weight is straightforward and should be comparable between different datasheets and test houses. Wipe absorbency can be expressed as intrinsic, i.e. calculated on a weight basis (ml/g), or extrinsic, calculated on an area basis (ml/m2). Intrinsic sorbency is sometimes referred to as efficiency and is a reflection of how well a wipe adsorbs or absorbs. Extrinsic sorbency is also referred to as capacity, or the total volume of liquid that can be held by the wipe. Usually wipe absorbency is calculated using water, but any liquid could be used as long as it will wet the wipe. Polyester wipes and cellulose wipes behave differently in the way they ‘sorb’ fluids. Polyester wipes are often described as being hydrophobic. Polyester wipes are very often said to be ‘not very absorbent’. It is true that polyester wipes need to be treated to render them hydrophilic. The fluid is not absorbed into the structure of the yarn but the surface treatment allows the fluid to be held in the interstices (spaces) between the fibres; this is referred to as adsorption. Once treated, the fluid capacity of a polyester wipe can exceed that of cellulose-based wipes. Cellulose-based wipes are inherently hydrophilic, where the fluid is absorbed directly into the fibre itself. The rate of sorption is a measure of how fast a wipe can sorb a liquid, which can be very important for life science cleanroom users, especially for the clean-up of spills and the application of disinfectant and cleaners. If the rate of sorption is slow, having to wait long periods of time for wipes to absorb the fluid before disinfectant application can take place significantly increases the time required for biodecontamination. It can also lead to a tendency to not wait for a wipe to become sufficiently saturated, resulting in sub-optimal disinfection. Rate of sorption is expressed in seconds and there are two main methods that can be used. In the first, a drop of water is allowed to fall from a set height onto the surface of a singular wipe; the time taken for the disappearance of the specular reflection from the drop is measured and recorded as the rate of sorption. Alternatively, IEST also describes a method for measuring the rate of sorption through a stack of wipes. A stack of wipes of known mass and weight is placed on the surface of water at constant temperature and the time for the stack to wet out is recorded. From these measurements and the mass of the wetted stack, a rate of sorption can be calculated. 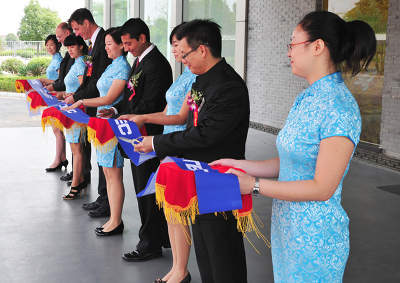 The functional tests are relatively straightforward to carry out. The calculation of overall capacity should be comparable between datasheets; however, rate of sorption using test 1 can be affected by the tension that the wipe is under, so care should be taken that the wipe under test is held in a special rig. Care should also be taken with test 2, to ensure that the wipes lie flat and no air pockets are created. If the wipes have been treated to render them hydrophilic, the water in the water reservoir should be changed regularly to ensure there is no leaching of the low surface tension treatment into the fluid. Tests for contamination that are regularly carried out by cleanroom users include: particles, non-specified extractable matter and individual ionic contaminants. Non-specified extractable matter: Most often this is shown on wipes datasheets as a measure of non-volatile residues or extractables. ISET-RP-CC004 describes two tests for the determination of the quantity of matter extractable from a wipe, without identification. One method assesses how dirty (or clean) the wipe is by extracting the total amount of matter accessible with a given solvent; the second method is a short term extraction that is likely to result in less-than-complete extraction, but that allows specific conditions for extraction to be specified. The result is usually expressed in g/m2 or occasionally % extractable matter. Most manufacturers will declare results carried out in two solvents – isopropyl alcohol (IPA) and deionised water (DI). Some manufacturers use the short term extraction, arguing that it most closely represents how the wipes are used in situ. Others will declare the total amount of matter extracted, so care should be taken to compare like with like when looking at different manufacturers’ data. 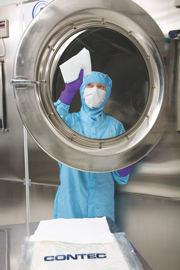 As well as non-specific extractables, certain industries need to know the ion content of a cleanroom wipe. The microelectronics, semiconductor and data storage industries are adversely affected by any ionic contamination. Generally expressed as parts per million (ppm) or parts per billion (ppb), contaminants analysed include cations of potassium, sodium, calcium and magnesium and anions such as chlorine, fluorine, nitrate, sulphate and phosphate. As standard, most companies’ technical datasheets will list sodium, chlorine and potassium extracted at either ambient temperature or elevated temperature. A range of different techniques are used to analyse the extract, including ion chromotography (IC), capillary ion electrophoresis, or inductively coupled plasma mass spectrometry. IC is the lowest in cost and, because of its versatility and sensitivity is used by the majority of manufacturers. 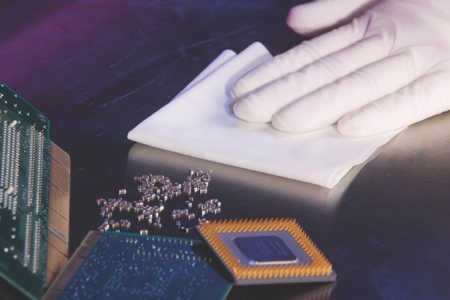 Most wipe manufacturers use the ambient extraction process and this, coupled with the fact most that manufacturers use IC, means ionic content can be comparable – however, this does assume the processes are the same. Fibres and particles: Unlike the testing for other contaminants, there is no specific answer to how many particles a wipe can potentially contribute to an environment. The testing for particles and fibres is separated into those present on the wipe surface – readily releasable particles – and those not already present on the surface but generated by exposing the wipe to mechanical action – generated particles. Fibres and particles can be reported in different size ranges. Fibres are classed as ≥100µm and particles from ≥0.3 to ≥5.0µm; typically, ≥0.5µm particles are reported. 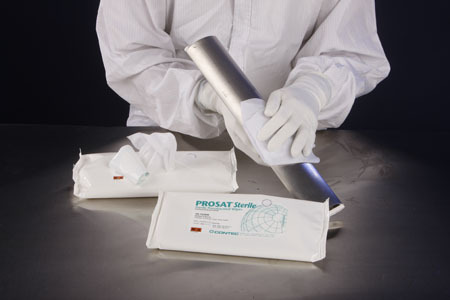 There are three main methods that can be used for particle and fibre testing: zero stress testing for readily releasable particles with no mechanical energy applied; orbital shake used to impart moderate mechanical energy; and biaxial shake used to impart vigorous mechanical energy to the wipe. Both the orbital and biaxial shake methods produce a combination of readily releasable and generated fibres and particles. Fibres and particles are then typically measured using a liquid particle counter. Scanning electron microscopy and optical microscopy for fibres greater than 100µm are also used. Due to the different methodologies, immersion solutions and analytical tools used and the combinations that can be created, direct comparison of different manufacturers’ datasheets is not recommended. It is very unlikely that a like-for-like comparison is possible. 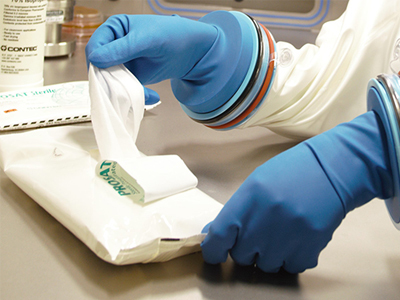 Comparing wipes from different sources is an inexact science due to the variability between different test methods and equipment. Valid technical data comparisons can be gained only through side-by-side testing of multiple samples in the same facility utilising the same methods and equipment under the same conditions. But does the data allow manufacturers to state that a certain wipe is a ‘class 3’ or ‘class 5’ wipe? Not really. As technologies evolved in the 1980s and 1990s, cleanrooms became much cleaner in response to the needs of the processes within them. Wipe technology and cleanliness followed to meet these needs. 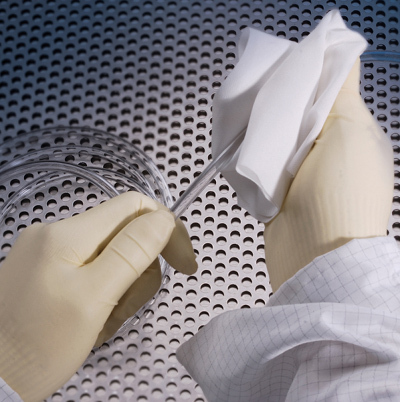 In the mid 1980s, when a Class 100 cleanroom was the height of cleanliness, the wipe of choice was a laundered, knife-cut, knitted polyester wipe – not because such a wipe was determined to be suitable for that environment, but because that was the cleanest wipe available at the time, for use in the cleanest environment at the time. 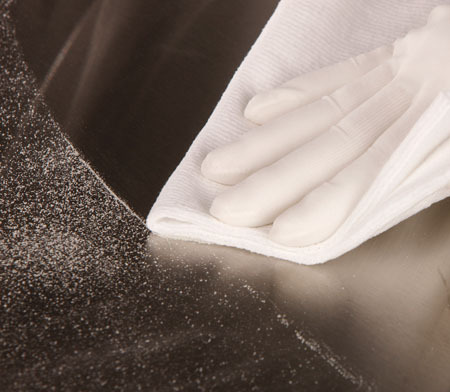 As cleanroom environments evolved to greater levels of cleanliness, wipe technology followed suit, with the introduction of sealed edge wipes, material treatments and presaturated wipes to eliminate excessive handling and aerosolised particles. 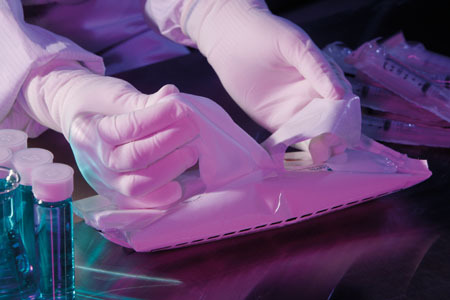 As discussed, tests exist for determining the inherent cleanliness of a specific wipe, and these can be useful in selecting the wipe best suited to the needs of the application and environment, but there is no valid, accurate and accepted test to determine or certify any wipe relative to the cleanliness level of the cleanroom itself. Wipe particle testing gives a result in particles/m2, but this is very difficult to compare with an airborne measure for cleanroom class of particles/m3 of air. 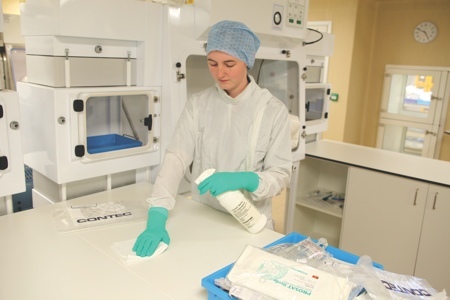 Contec carried out some test work in a Grade B cleanroom4 to try to create a protocol for in-use testing, but this proved inconclusive due to too many factors in play. Further consideration also needs to be given as to whether airborne particle counts or particles remaining on the surface are the correct parameters to measure. So is there such a thing as a class ‘x’ wipe? 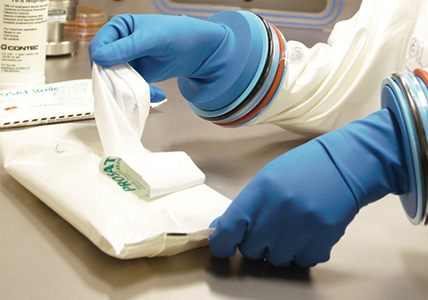 The determination of which wipe can be used in a particular cleanroom has always been, and remains, dependent on what processes are conducted within the cleanroom environment, and what wipe is most appropriate to the application (poses the least contamination risk to the process, absorbs liquids the best, is most durable, etc.) 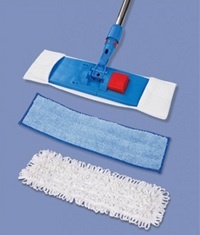 while still fulfilling the needs of the wiping or cleaning activity required. Even IEST Recommended Practice acknowledges that ‘this RP does not categorise wipes according to their suitability for particular applications. Rather it offers rational and germane tests to determine those characteristics of wiping materials generally acknowledged to be important. The results of these tests permit quantitative assessment of the merits of wiping materials according to their mix of properties considered important in relation to their intended use’. The author would like to acknowledge the contribution of Dave Nobile, Senior Technical Specialist, Contec Inc.
4. EU Guidelines to Good Manufacturing Practice Medicinal Product for Human and Veterinary Use, Annex 1 Manufacture of Sterile Medicinal Products. The Rules Governing Medicinal Products in the European Union. Brussels: Commission of the European Communities, 2008, Vol. 4.